Join author teacher Karen Tyrrell as I share my secrets and guide you every step of the way. I’ll teach you how to market, sell & distribute your book to the widest possible audience with a pro-active marketing plan. Topics include how to optimize your book marketing, your author platform, your website SEO, social media influence, book reviews, blog tours, media releases, book sales and book distribution. What are my Credentials for presenting a Book Marketing Masterclass? Karen Tyrrell is a Brisbane triple award winning author and publisher of five books, teacher, writing tutor, and workshop presenter. 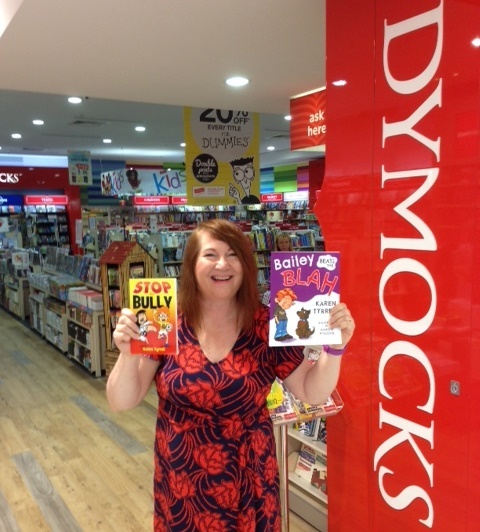 Currently Karen’s books are available world-wide and sold at Dymocks and Angus & Robertson book shops and many More …PLUS international online book shops. Book shops HERE. Karen presented writing talks at Queensland Writers Centre, CYA children’s Writer Conference, Gold Coast Writers Festival, River City Writers Conference, schools, libraries and festivals. She speaks on TV and radio and writes for South City Bulletin magazine. 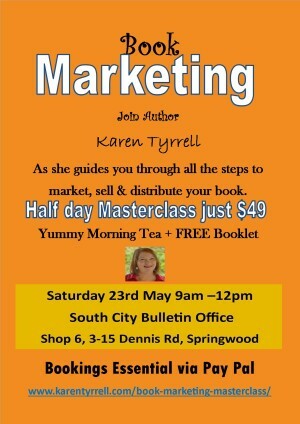 COST: $49 includes a yummy morning tea, nibbles, coffee and tea provided and a FREE interactive book marketing information booklet. Let 2015 be the year you get your book out to the world! Are you joining the FUN? Hi – any chance of going online with this? I’m interested, but don’t have funds for travelling right now. Bring on the webinars! Thanks so much for expressing your interest for a Book Marketing Webinar. Thanks for your advice on Facebook. I am in Coffs Harbour and unable to travel to Brisbane. Should you decide to conduct a webinar, I would also like to join. I would be happy to pay a fee for your seminar. Thanks so much for leaving your Expression of Interest with a future webinar on Book Marketing.